So Gromit is left to run things on his own, when he'd much rather be getting better acquainted with Piella's lovely pet poodle Fluffles. Can he save his master from becoming the next baker to be butchered?. Wallace & Gromit: Curse of the Were-Rabbit 2005 DVD Movie - NEW SEALED!! 5 out of 5 stars - Wallace & Gromit: Curse of the Were-Rabbit 2005 DVD Movie - NEW SEALED!! 58 product ratings58 product ratings - Wallace & Gromit: Curse of the Were-Rabbit 2005 DVD Movie - NEW SEALED!! Posingas an innocent lodger, the fiendish fish-eater sets about recruiting mild mannered Wallace as an unwitting accomplice to his dastardly plot - a diamond heist with atechnically advanced, trouser-inspired difference. Title - WALLACE & GROMIT - 3 CRACKING ADVENTURES! A CLOSE SHAVE. THE WRONG TROUSERS. Title:Wallace and Gromit - Wallace And Gromit - Special Edition Tin Box [DVD]. Artist:Wallace and Gromit. Your item will be previously owned but still in great condition. The disc will play perfectly without interruption and the case, inlay notes and sleeve may show limited signs of wear. 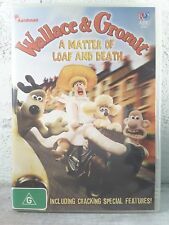 Wallace & Gromit - A Matter of Loaf and Death [Blu-ray] [Region Free]. Title:Wallace & Gromit - A Matter of Loaf and Death [Blu-ray] [Region Free]. All of our paper waste is recycled within the UK and turned into corrugated cardboard. Two disc special edition,cracking film! Good - New Condition Item. Our Ref - SDB. Distributors in the UK. Region 1: U.S., U.S. Territories, Canada, and Bermuda. Region C/3: India, Nepal, Mainland China, Russia, Central and South Asia. Wallace And Gromit - The Curse Of The Were Rabbit (DVD, 2006, 2-Disc Set). Condition is Like New. Dispatched with Royal Mail 1st Class Large Letter. Wallace And Gromit - The Curse Of The Were Rabbit . Title:Wallace And Gromit - The Curse Of The Were Rabbit . All of our paper waste is recycled within the UK and turned into corrugated cardboard. Wallace And Gromit - The Curse Of The Were Rabbit (DVD, 2006, 2-Disc Set). Condition is Good. Dispatched with Royal Mail 1st Class Large Letter. Technically advanced, trouser-inspired difference. has murdered all the other bakers in town. Can Gromit save his master from becoming the next baker to be. as an innocent lodger, the fiendish fish-eater sets about recruiting mild mannered Wallace as an unwitting accomplice to his dastardly plot - a diamond heist with a.
Aardman dvd 'Curse of the Were-rabbit' used but still in excellent condition. Disc 1 contains the film. A CLOSE SHAVE. THE WRONG TROUSERS. Wallace And Gromit - 3 Cracking Adventures DVD - Region 2 U Nick Park Aardman ! Nick Park's Aardman Animations - Wallace & Gromit. 4 out of 5 stars - Wallace And Gromit - 3 Cracking Adventures DVD - Region 2 U Nick Park Aardman ! 1 product rating1 product ratings - Wallace And Gromit - 3 Cracking Adventures DVD - Region 2 U Nick Park Aardman ! So Gromit is left to run things on his own, when hed much rather be getting better acquainted with Piellas lovely pet poodle Fluffles. Can he save his master from becoming the next baker to be butchered?. 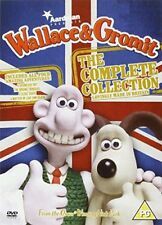 Wallace And Gromit - 3 Cracking Adventures (DVD, 2005). Condition is Good. Dispatched with Royal Mail 1st Class Large Letter. 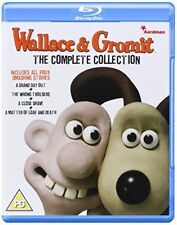 Wallace And Gromit The Complete Collection [Blu-ray]. Collection of four Wallace and Gromit adventures A Close Shave. On a single DVD with a protective sleeve over the plastic case. In 'The Wrong Trousers' (1993), Wallace and Gromit encounter difficulties with the demonstration of the inventor's 'Techno Trousers' and encounter a rogue chicken. Title: Wallace and Gromit: The Complete Collection - 20th Anniversary. Another dollop of animated mirth and mayhem with the cheese-loving inventor Wallace (voice of Peter Sallis) and his long-suffering dog Gromit. Wallace And Gromit - The Curse Of The Were Rabbit (DVD, 2006, 2-Disc Set). Condition is Very Good. Dispatched with Royal Mail 1st Class Large Letter. Wallace & Gromit: Curse of the Were-Rabbit [DVD]  [Region 1] [US Import] [NTSC]. 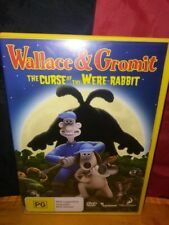 Title:Wallace & Gromit: Curse of the Were-Rabbit [DVD]  [Region 1] [US Import] [NTSC]. All of our paper waste is recycled within the UK and turned into corrugated cardboard. [Wallace And Gromit: Three Cracking AdventuresD]. Gromit's only too happy to help, and before long the inventive duo is on the moon, where they encounter a clever appliance that's part oven, part robot, part lunar skiing enthusiast. well, you just have to see the movie to understand how any of this whimsical lunar-cy can make any sense! Trending at C $3.41eBay determines this price through a machine-learned model of the product's sale prices within the last 90 days.